This past weekend found me pushing pause on the quilt making and picking up a paintbrush for the Cafe. This little cupboard was the ugliest rust brown. Several coats of white breathed some new life into it. The decals were made using vintage "Happy Birthday" wrapping paper. 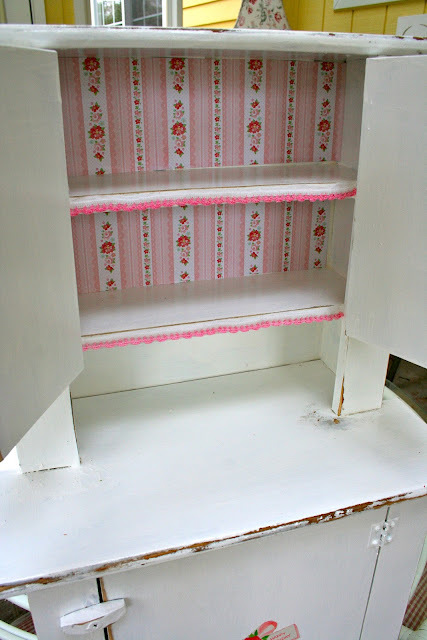 I lined the cupboards with scrapbook paper and some crochet trim from an old piece I had in my scraps. The bottom half is lined with the vintage paper. I left the corner that gives the copyright of 1962, the year I was born. The biggest project of the weekend was this cut out cupcake. I had fun using my jig saw and drill. It took a few hours to complete. I hope the little ones that visit the cafe will enjoy peeking through to get their picture taken. Tomorrow marks the 50th day of the cafe opening and we are celebrating with an icecream social. Everything is better with icecream (and sprinkles!). Oh, love that lovely new cabinet. 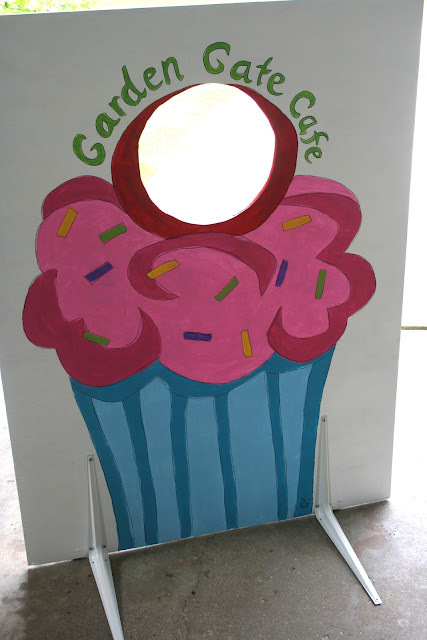 I'm sure kids, and probably more than a few adults, will love having their picture taken in the cupcake too! What an adorable little cupboard. At first I thought it was a full sized piece of furniture, then later noticed it's sitting on your coffee table. So precious with the papers and the decal. I love the cupcake idea for pictures too. Wow you really did get a lot done over the weekend. It's always nice to take a break from sewing and being crafty in another way. 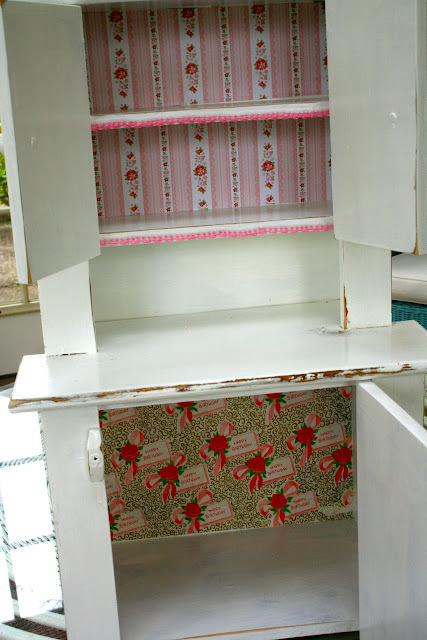 What an adorable cupboard and you are brilliant to use the vintage wallpaper for a great vintage decal! I love the cut out cupcake! And the cupboard is very nice too! Great job. 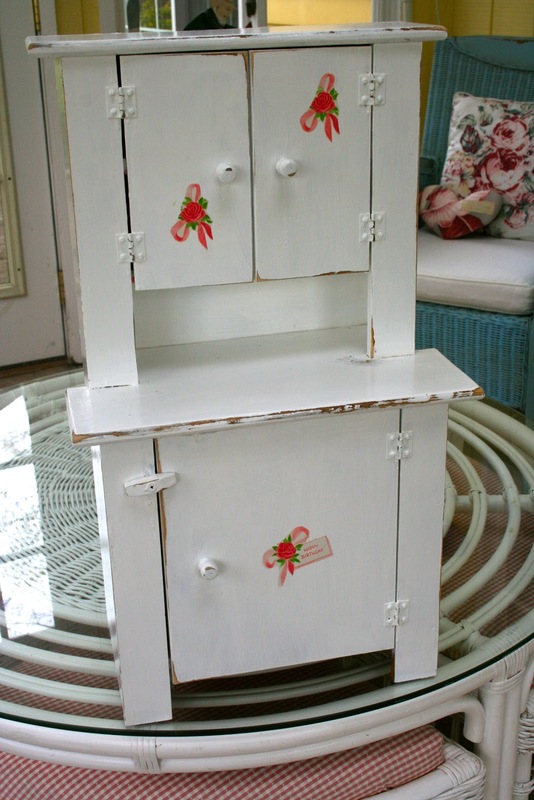 Rene that little cabinet turned out so adorable! I can imagine it filled with vintage children's dish ware. The cupcake sign is cute too. I was looking at Shann's blog and saw the window at the cafe. Awesome Renee! I love the cutout cupcake too, the little ones will surely enjoy that, no doubt. I agree that the cupboard is outstanding as well. Great job! I especially love that you honor the Lord Jesus in all that you do. He is very pleased I am sure. You blog is so sweet and uplifting! It is such a joy vIsiting each delightful post. How I love your sprinkling of special passages of God's Word! I am new in the blogging world and have much to learn. Whatever I do I hope it will always bring glory and honor to God. Thank you for your charming and creative inspiration!